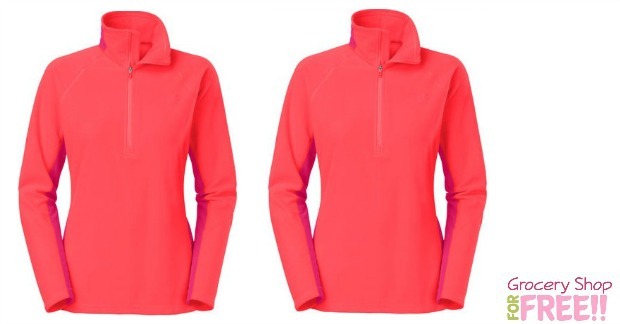 North Face Women's Half-Zip Jacket Just $31.99! PLUS FREE Shipping! Was $65! You are here: Home / Great Deals / Christmas Deals / North Face Women’s Half-Zip Jacket Just $31.99! PLUS FREE Shipping! Was $65! North Face Women’s Half-Zip Jacket Just $31.99! PLUS FREE Shipping! Was $65! You can get this North Face Women’s Tech 100 Half-Zip Jacket for just $31.99! PLUS FREE shipping or FREE pick up in store! It’s normally priced $65! It’s on sale from $65 down to $39.94! Just use code: GIFTS20 at checkout to get this great deal! Get on the trail of comfort and performance with the The North Face Women’s Tech 100 Half-Zip Jacket. Made of 100% polyester fleece fabric, this jacket features FlashDry technology which speeds moisture-wicking time for quicker drying, so you can remain at the top of your game even in wet conditions. A half-zip style provides ventilation options for cooling, while the fleece design provides warmth if the temperature starts to drop. This jacket provides midweight warmth while also being high-performance for all your active endeavors. Imported.